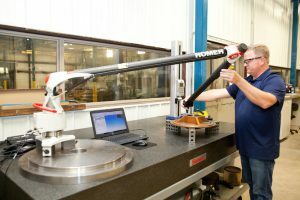 D&N Machining offers a state-of-the-art inspection systems and processes in our Quality Control Department including two Coordinate Measurement Machines (CMM) that have the linear precision to 0.0001″. We have a 1,450 square foot temperature controlled lab that houses the latest and most efficient measuring technologies. We are able to check the hardness of all sizes of parts, with both tabletop and portable hardness testers. For our operators we have a full complement of precision micrometers, calipers, surface plates, digital height gages, digital bore micrometers, surface roughness testers and more. A routine schedule of inspection and recalibration is maintained for each device to ensure measurement integrity. Every dimension of the first part is checked and recorded on the First-Off report. This is to ensure that our customers receive parts made exactly to their specifications. A copy of the first article inspection report can be provided with shipments upon request. Inspections continue and are recorded throughout the manufacturing process. This not only occurs at the start of each operation but also periodically during the operation. We believe that it is crucial to produce parts as close to the target dimensions as practical. Just prior to carefully packaging components into boxes for shipment, we perform a final inspection. A random sample is pulled from the lot and thoroughly inspected and a Final Inspection report created. Dimensions are verified as are any required finishes, coatings and the overall appearance of the component. We are certified to conduct magnetic particle inspections and liquid penetrate tests. This is used to locate surface-breaking defects in all non-porous materials without causing any damage to the part. * Our Quality Manual is available upon request.